Mr. Angel Gurría, Secretary-General of the OECD, was in Berlin on 5 April 2016 at the invitation of Mrs. Angela Merkel, Chancellor of the Federal Republic of Germany, to attend a meeting of the Heads of International Organisations (International Monetary Fund, OECD, World Bank Group, World Trade Organization and International Labour Organisation). While in Berlin, the Secretary-General presented the 2016 OECD Economic Survey of Germany. 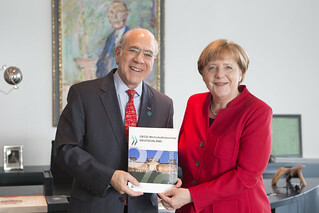 5 April 2016 - OECD Secretary-General Angel Gurria presents the 2016 Economic Survey of Germany to Chancellor Angela Merkel. Berlin, Germany.